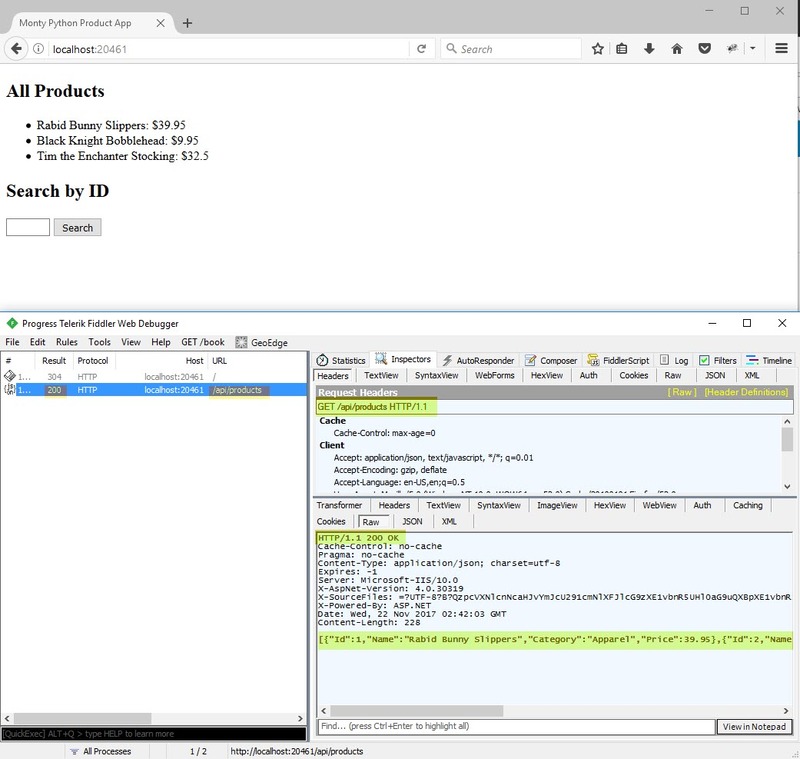 If you haven’t used it, Fiddler is a web debugging proxy. It works like the Network tab of the Developer Tools in your browser, only it works for all network traffic (not just via the browser). You can set the proxy up so traffic from your phone flows through it as well. It records network traffic, between your computer (or phone) and the Internet. That’s pretty much it. It can do a lot of things with that traffic, though. A LOT. And it’s free! When I’m testing anything, really, I have it running. I’ve caught a few bugs just by happening to see that flash of red because a call to an API failed, or a resource couldn’t load. Not something a user would notice, and probably not a tester either if not for this tool. And I’m sure many more reasons are out there! Note that a tool like Fiddler will work if your website is calling APIs directly. If there’s some middleware that’s handling that, Fiddler won’t catch those calls. You’ll need to find another tool that your service hits directly. Ok let’s get to Fiddler (download Fiddler here!). If you haven’t used it before, it might be confusing. There’s a LOT there. The left section is the Session List (all of the requests made over the network), the right is where you understand or manipulate those requests and responses. 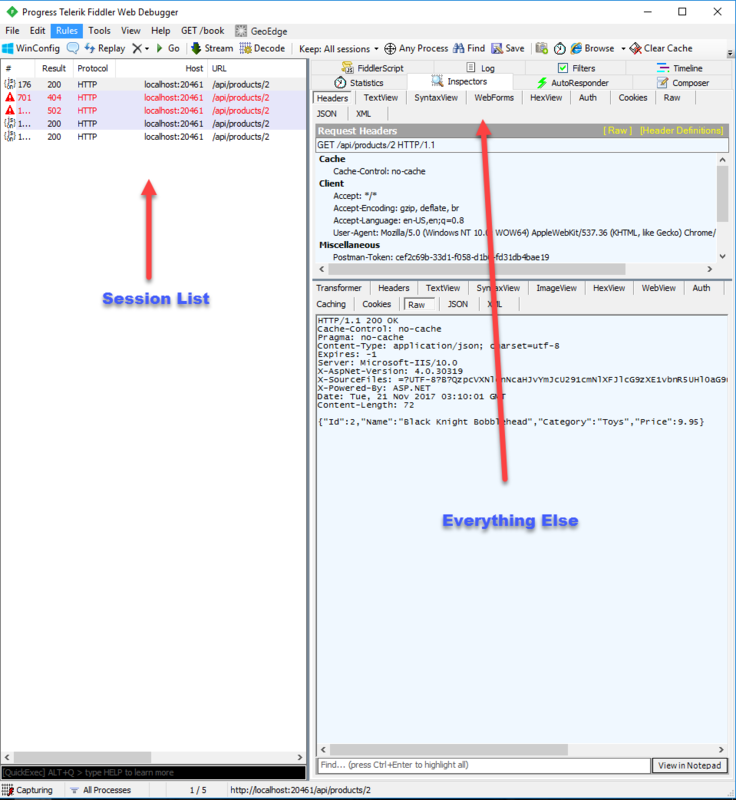 As you browse, as the websites you’re on make requests, the Session List will fill up (depending on if you’re capturing HTTPS). Clicking on one of the sessions will show you a plethora of information in the right pane. In the Inspectors tab, the top is everything about the Request, the bottom is the Response. For example, I have a simple API that I wrote (just for practice creating a REST api in C#) that has a corresponding webpage. When I load the page, Fiddler does a GET call to my REST api in order to populate the page. 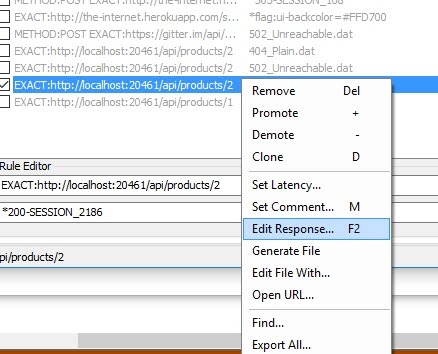 In the Session List you can see that the Result was a 200 (OK), and the URL that it effectively hit was /api/products. 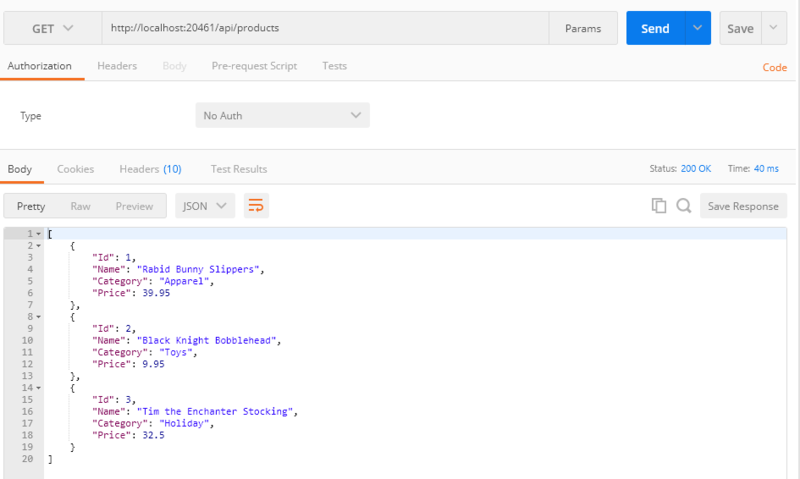 On the right side, in the Request, you can see what the exact request was – GET /api/products. In the Response, on the bottom, you can see the Response Code was 200 OK, and then after the Headers, the JSON of the data that was returned from the GET call. Now that we’ve got that baseline, we can mock a response. Let’s make the request for item 1 (the Rabid Bunny Slippers) return a 404 (Not Found) response. We don’t need to remove it from the code or the database, we just need to do a quick series of steps in Fiddler, and voila! Like magic! I take my session from the Session List, drag it into the AutoResponder rules, then change the ruleset to a built-in one for 404. I click Save, enable the rules, then make my request again. You can see on the webpage it says “Error: Not Found”, and in Fiddler, the session shows up red, with a Result of 404. You can see under Rule Editor that I’m looking for an EXACT match to that request. If I make a request for product 2, I’ll get product 2 back without issue. I can change this using regular expressions and such. For the response, you can find a file on your machine, or choose from the default options available. I have a session of loading the page in my rules, then just set the response to 502. So when I reload the page, none of my products show up. A search for individual ones still works because obviously the server isn’t actually unreachable. I set the delay to 1000 (assuming that’s milliseconds). It’s kind of quick, but you can see on the webpage it takes a bit for the response to come back, and in Fiddler the session takes a bit to show the Result. I’ve used this with automation, actually. If there’s an element that sometimes is slow to load, I’ll put this delay on it and make sure my automation can handle it all the time. Or if I’m trying to test something that gets overtaken by another element, and I just need to slow it down a little bit. Another part of responses you can change is pretty much ANYTHING. If you right-click on a session you’ve added to rules, and select Edit Response. Change the Response Headers, the Response Body (such as enabling elements on the page that you want to see, but the code keeps it hidden for some reason). Again, useful in automation but also any other kind of testing! There’s way more than I can (or want to) cover in a single blog post. I just wanted to throw together a quick post (that took a bit longer than I anticipated to put together!) about how I use AutoResponder. How have you used it? Anything I’m doing dreadfully wrong? Any tips or tricks you have learned? Please share in the comments! it’s good to be here on your blog today. ? Compliments of the season!Trust me you shared a very fantastic post and one that I truly resonated with and I’m glad that I could actually draw lesson from it.This would really help me I’m sure in growing my blog.Thanks for sharing with this great community! ?